Well, dear reader, I apologize for taking so long to get anything up on this blog. I've been really busy with family, friends, and Masonry. But I'm back to give a little bit of my adventures during the month of June. In May, I was installed as Captain General for Faribault Commandery No. 8. It has been great to serve in this capacity and attempt to bring forward a great many ideas to encourage the Templary side of Masonry. June became a crazy month for me. The first big event was the first Order of the Temple to be conferred in Faribault in many decades. For many years, new Sir Knights had to go through the One Day to Templary or find a place to do courtesy work. However, after many years of working, gaining incrementally, and reviving the spark, we turned the Commandery around and now have many new Sir Knights willing to jump in and do the work. All this culminated in the Order of the Temple. Special thanks to the Sir Knights of Cyrene No. 9. The Sir Knights of Faribault Commandery with our two newest candidates. This next event was a Saint John's Day procession to attend worship services. This year, we attended the services of the Congregational Church of Faribault. Faribault Lodge and church have had the same members since the founding of both. The Grand Lodge of Minnesota laid the cornerstone of the Parish House for the Congregational Church. Cornerstone of the Parish House. 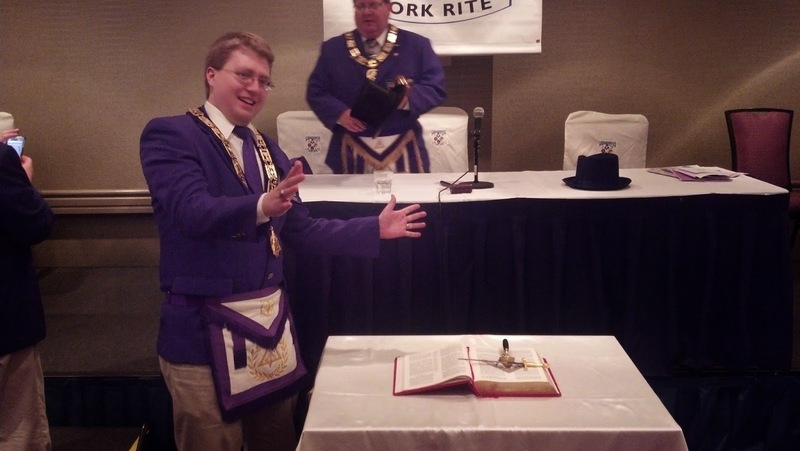 PGM Jenkins, PM of Faribault Lodge No. 9 , was the presiding GM in 1923. We, as a lodge, opened and assembled ourselves into procession. We processed the three blocks from the lodge hall to the Church, in full regalia. We then sat for services. It was a wonderful day without rain. (Minnesota now apparently has three seasons, winter, road construction, and rainy.) Thanks to Pastor Jan and the wonderfully welcoming congregants of the Congregational Church of Faribault. Then, the next day, Monday the 24th, I attended a Saint John's Day procession being held by Red Wing Lodge No. 8. I was the Marshal, as I have planned these processions in the past, and was honored to serve in that capacity. This was a procession to the local Lutheran Church but without any worship services. Instead, we were fortunate to behold a fantastic meal set before us and a wonderful speech on Masonry in America by MWB Tom H., PGM of Minnesota. It was a wonderful and moving experience for all involved. Now, if all this was not enough, I attended the Grand York Rite Session as I am both the Principal Conductor of the Work for my Cryptic Council, Northfield Council No. 12, and Captain General for my Commandery. I also happened to have been appointed and installed as the Grand Chaplain for the Grand Council of Cryptic Masons of Minnesota. So yes, I am a purple coat now. Thank you MIGM Jim for your confidence in me in this endeavor. Ta da! Notice that I have the wrong apron. I think that's it in the Masonry sphere. It's been busy but that's cool. Hopefully, we can keep this going. I have many more ideas I'd like to implement and hopefully, I can continue to write about them.